Our company has partnered with several security technology firms specializing in encryption, camera systems and even forensic labs to provide the utmost secure environment for your data. We take your information very seriously as breaches in your current infrastructure could cause head aches in terms of liability as well.With so many choices our there for Data Security, it can be painful if not impossible to choose the right service provider for your specific needs, which is why 4 Corner IT offers a free consultation, to guide you in the right direction. The consultation process is perhaps the most crucial time as we are gathering information to best assist your organization. Our account specialists take a hands on approach, using knowledge that have could have been acquired by none other than real-world training and experience. 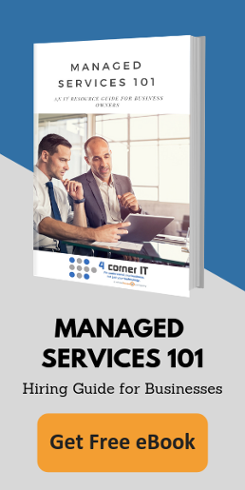 4 Corner IT has been providing Data Security managed services for over ten years.